Naturally blue food is not normal. 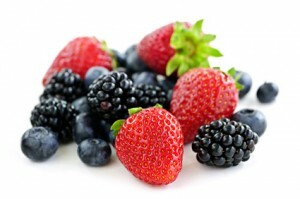 The deeper blue or purple a berry is in color, the higher the antioxidant power. Even though our bodies have their own way of making antioxidants, we still need foods that are rich in them.Some of the essential antioxidants such as vitamin C,E and manganese which our bodies can not generate, are found in blueberries. They are a super food known for slowing aging and fighting disease. Besides blueberry pancakes, muffins and a cereal topper, try blueberries in a salad with arugula, walnuts and blue cheese. with a light dressing of olive oil and lime juice. Rinse a heat proof 2 qt. jar with boiling water. Drain it and in it combine sugar, blueberries and vodka. Seal the jar tightly and let it stand in a cool, dark place, shaking the jar occasionally for two months. Strain the cordial through a fine sieve lined with triple thickness of rinsed and squeezed cheesecloth. Serve as an after dinner drink or with tonic over ice as a cocktail. Raspberries and black berries share significant amounts of polyphenol antioxidants and rank near the top of all fruits for antioxidant strength (with only blueberries ranking higher). Raspberries have one of the highest fibre contents known. They both are a rich source of vitamin C, manganese and dietary fibre. They contain B 1-3, folic acid, copper and iron. Blackberries contain vitamin K.
Coarsely chop half of the raspberries and toss them with the remaining whole berries, mint, basil & jalapeno. Toss with the lemon juice, salt and pepper. Let stand no longer than 10 minutes before serving. Use on grilled chicken or pork. Just as blueberries, raspberries and blackberries have high content of antioxidants, so do strawberries rank up there in the top four. Strawberries also have a vitamin C but studies show that after 2 days maximal storage, there is a significant loss in vitamin C and antioxidants. Given the unique combination of antioxidants and anti-inflammatory nutrients, there is strong research supporting the health benefits including cardiovascular support and prevention of disease, regulation of blood sugar and prevention of certain types of cancer such a breast, cervical, colon and esophageal.